Sturdy with dark green leaves a capsicum plant is easy to grow. We are prominent Breeder, Producer and Supplier of Hybrid Capsicum Seeds (Sweet Wonder) in Bangalore, Karnataka. 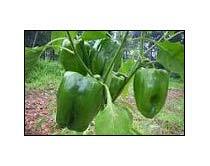 We offer a wide range of Hybrid Capsicum Seeds which are high in yielding capacity. We supply a great range of top quality seeds at reasonable rates.